I honestly have no idea how I feel about this book. I was bored. I was interested. I was skeptical. I was encouraged. I felt like the book was written by different people. Sometimes it read as though parts of a science text book had been copied and pasted in. Some parts were interesting and you could feel a genuine interest by the author. Often I had no idea what his opinion was on things because of how he stated something or tried to say something by asking a question. He was trying to "rob bell" his point if you know what I mean. Basically I think he was trying to convince the Christian church at large that the word mystical is okay. He did quite a bit of presenting the inner workings of the brain in relation to prayer and told about how our bodies are wired to respond to the stimuli of prayer. It was interesting, but I really only got something out of about 10 pages of the book. Those ten pages were good. 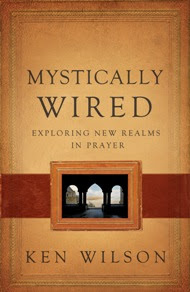 I am encouraged to press more deeply into prayer. I was encouraged to spend more time enjoying the Lord in the out of doors, to meditate more on scripture, and to pray at intervals during the day (as we saw Daniel doing). Some of it was a little weird to me and I can't recommend the book as a whole. I am taking the sentences I gleaned and pressing on in prayer.